If you are interested in ordering the following stamp products, please click here. For more information on stamp product categories, please press here. Get ready for a new year hosted by our adorable piggy! 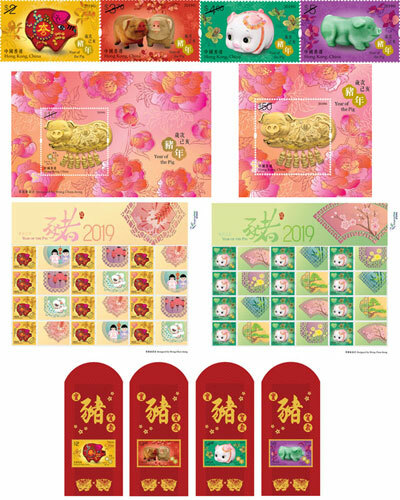 The eighth of Hongkong Post’s fourth Lunar New Year special stamp series – the “Year of the Pig” issue – celebrates the Lunar New Year with four pigs, modelled in embroidery, wood carving, porcelain and jade carving. Sweet and good-natured, these plump icons of good fortune are sure to win every heart. This issue is accompanied by a paper stamp sheetlet and a silk stamp sheetlet that bring out the gaiety and festive spirit of the New Year. Co-starring the dog and the pig, this glittering stamp sheetlet is full of festive joy. 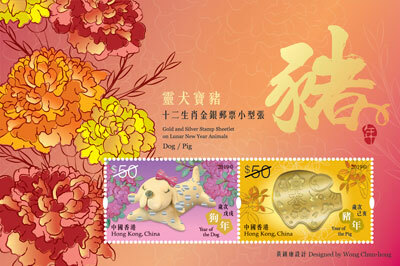 Signifying the old making way for the new, year of the dog and year of the pig stamps on the sheetlet are lavishly finished in silver hot foil and 22K gold-plate respectively. This highly collectible sheetlet comes with a gold fineness certificate. It is an ideal paper ornament for the Lunar New Year. The latest silver hot foil Chinese zodiac stamps feature the monkey, the rooster, the dog and the pig. 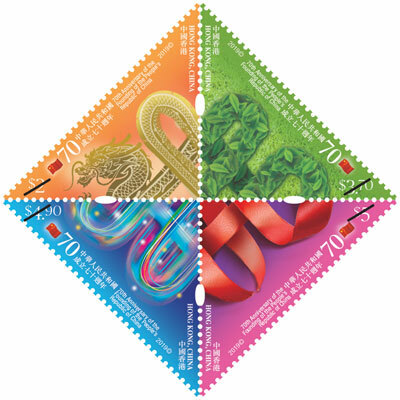 They are the second set of the fourth Lunar New Year stamp series. This four-piece set is based on Chinese zodiac animal designs for 2016, 2017, 2018 and 2019. Printed in lithography with silver hot foil stamping and an embossing effect, each of the monkey, rooster, dog and pig motifs is lifelike and full of individual charm. The Government Flying Service (GFS) is a disciplined service of the HKSAR Government backed by professional expertise and outstanding skills. The GFS provides flying services to the public and government bodies. Addressing the pressing needs of the public, the GFS rises to challenges and serves society with full dedication. Safety comes first for every trip and equal importance has been attached to efficiency and economic effectiveness. This set of stamps illustrates six major GFS operations. 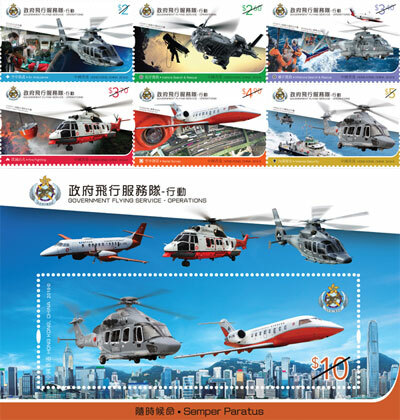 A stamp sheetlet from the same series showcases different aircraft models in the fleet to give the public a more complete picture of this aviation service. The West Kowloon Cultural District on Hong Kong’s harbourfront ranks among the world’s biggest cultural projects. It enriches Hong Kong with a new landmark of our fascinating culture and provides a platform for interactive collaboration and development of local arts. The Xiqu Centre sits prominently in the eastern corner of the West Kowloon Cultural District. Its unique outlook blends traditional and contemporary elements to give Chinese opera a whole new image. It is also an ideal venue for a host of events, with a view to preserving and developing Chinese opera. 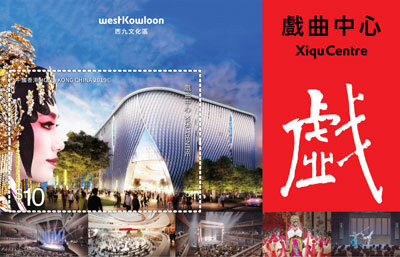 This eye-catching stamp sheetlet presents the distinctive exterior and interior of the Xiqu Centre. Guided by the motto “We Love, We Care, We Serve ”, Pok Oi Hospital has made tireless efforts to serve Hong Kong. It has also continued to diversify and expand hospital services through the years. Today, the extensive Pok Oi network encompasses all local districts across Hong Kong to meet the needs of people from all walks of life. To mark the centenary of Pok Oi Hospital, Hongkong Post is issuing a set of four commemorative stamps. The rich colours and dynamic strokes introduce us to the hospital’s four key service areas: Western and Chinese medicine, education, elderly care, and, family and youth services. Since its inception in 1844, the Hong Kong Police Force has always done its utmost to maintain social order and protect life and property. 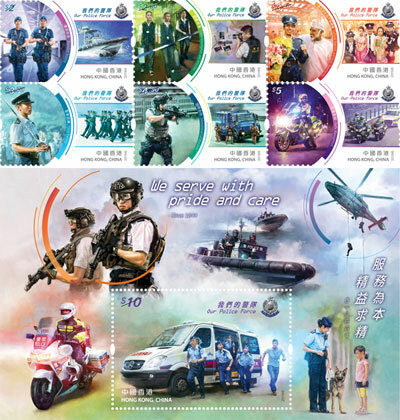 To help the public learn more about the unique attributes and extensive services of our distinguished police force, Hongkong Post is pleased to launch a set of six stamps and a stamp sheetlet. Stamp lovers can see different areas of police duties presented in dynamic designs, including boundary security, crime investigation and detection, cultural diversity and equal opportunity, police training, international collaboration and traffic management. 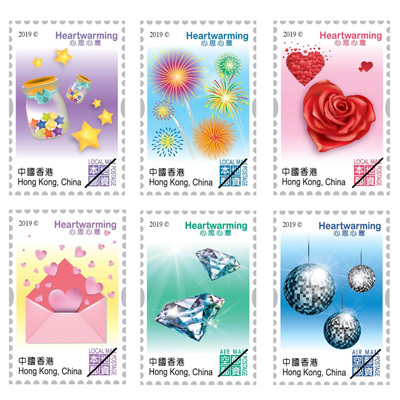 Hongkong Post’s seventh “Heartwarming” stamp issue comprises four "Local Mail Postage" stamps and two "Air Mail Postage" stamps in simple but adorable designs. This is a convenient yet thoughtful way to send warm wishes and blessings to your loved ones, capture happy moments or celebrate important events. 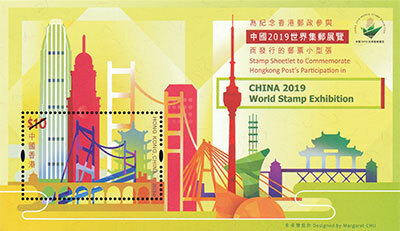 The FIP World Stamp Exhibition 2019 will be held in China and Hongkong Post is honoured to be part of this great event. 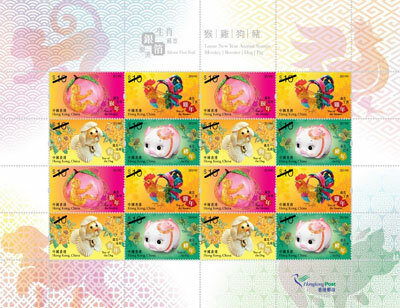 A special stamp sheetlet is released to commemorate Hongkong Post’s participation in this significant occasion. Geographically well-placed with a favourable climate, Hong Kong enjoys rich marine biodiversity. Within our boundaries are multifarious marine ecosystems where diverse species live, breed and interact. Revealing our beautiful underwater world, this six-piece issue aims to promote awareness for marine conservation in the hope of making joint efforts to preserve our precious marine life. For extra fun, the souvenir sheet features fish-shape perforations to match the overall fish silhouette. 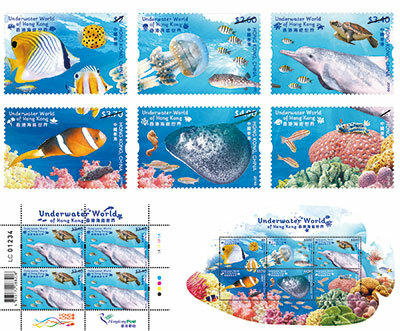 The issue also includes six mini-stamp sheets, each with four stamps of the same denomination. These mini-stamp sheets are the first of their kind and thus highly collectible. World Heritage in China Series No. 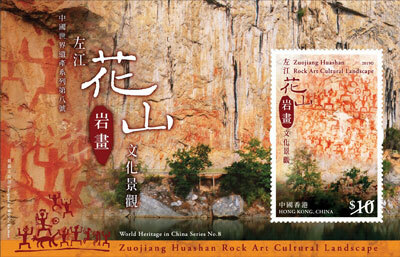 8 by Hongkong Post showcases the rock art cultural landscape of Zuojiang Huashan. Included in the World Heritage List in 2016, these rock art sites are located on steep cliffs above the Guangxi Mingjiang River and Zuojiang River in the border regions of southwest China. They are the works of the ancestors of the Zhuang ethnic minority, illustrating the lives of the Luoyue people and the ancient bronze drum culture. Featuring the rock art in close-up and on the sheer riverside cliff faces that stretch for miles, this stamp sheetlet gives the public a chance to admire this celebrated cultural heritage. Founded on 1 October 1949, the People’s Republic of China is celebrating its 70th anniversary in 2019. The nation has recorded remarkable development and achievements in the past seven decades. Chinese people will continue to work shoulder to shoulder in striving for a better future. This set of four stamps portrays the traditional ruyi knot. The composition is detailed and refined, signifying China’s robust development and remarkable attainments on social, environmental, technological and economic fronts. Continuing its journey on our major hiking trails, Hong Kong Hiking Trails Series No. 2 takes you to the MacLehose Trail this year. The 100km MacLehose Trail is divided into ten sections that stretch across eight country parks. It offers a memorable experience in Hong Kong’s beautiful countryside as well as the true pleasure of hiking. 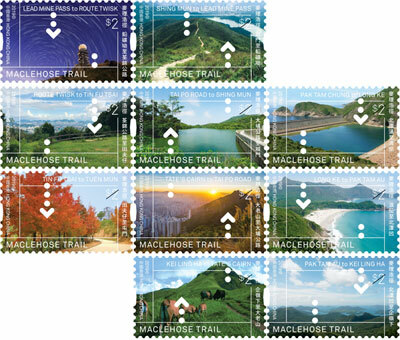 The stamps show the way with cut-out arrows and dots, taking you through the ten scenic sections of the MacLehose Trail. As a special touch, the stamps are printed with the soil from the trail and are definitely not to be missed. The Comic book “Old Master Q” has enjoyed great popularity in Chinese communities around the world for more than five decades. Hongkong Post has chosen this well-loved comic title as the theme for a stamp issue. Scenes of leisure and everyday life plus local elements of Hong Kong add up to a set of eight stamps and two stamp sheetlets. The gummed backside of the stamps is also printed with motifs. For the first time, you can put together a line-up of Old Master Q characters on the back of the stamp sheets and different characters are printed on stamp sheets of different value. The $20 stamp sheetlet features the autograph of the comic’s creator Alphonso Wong and is printed with hot foil stamping. This will surely be a much sought-after issue for stamp lovers. *Final issue dates, prices, names, stamp designs and formats are subject to change. All special/commemorative stamps and associated philatelic products will be available at all post offices from date of issue, while stock lasts.